We asked you to share a photo of you, your child or family on our online community and caption the image with your idea for change. We will pull all the ideas and photos together to create a pictorial report to share with our community, advocates, industry leaders and policymakers. Let’s spark change today, together! Five entries were selected to win a Kids With Food Allergies prize package. 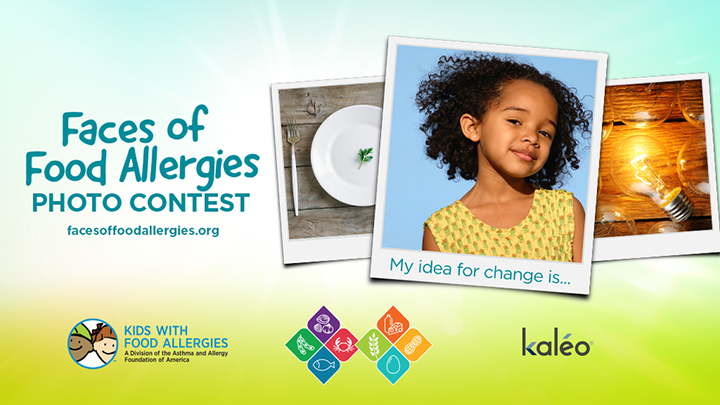 The 2018 Faces of Food Allergies photo contest is made possible by kaléo. The photo contest is now closed, but you can still add your idea for change! Take a picture showing an issue you face living with food allergies every day. Upload your image to our Kids With Food Allergies community - you must be registered to upload your image. All photos shared can be seen by the public. Only registered members can upload clips, add comments, or view members' profiles or signatures. Images will be added to our mosaic below. Winners received a Kids With Food Allergies prize package (approximate retail value - $140.50). Members outside of the United States may share their photos, but are not eligible to win. Up to 3 entries are permitted, however there is limit of one prize per person. No purchase necessary, void where prohibited, US residents, 18+. Promotion begins 5/13/18 ends 5/19/18. Click here for official rules.